Spokane, WA--The Spokane Indians announced today that Madison Elementary and Logan Elementary have been selected to participate in this year's Itron Champions Program. 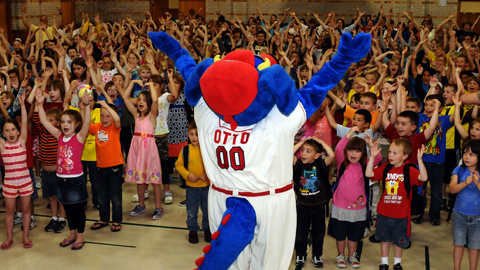 Every year, the Itron Champions Program provides two low-income Spokane schools with a visit from OTTO the Mascot and 250 Indians tickets to distribute to their students as a reward for good attendance, hard work, and achievement in the classroom. "We love bringing the Itron Champions Program to schools and getting kids excited about learning," said Indians Senior Vice President, Otto Klein. "This is a great opportunity for the Indians to support our local schools and students." "Supporting young people is of great importance to Itron and that is why we are proud to support local students through the Itron Champions Program," said Diane Vanos, Manager, Community Investment. "Encouraging hard work, good attendance and achievement in the classroom today will help shape the future leaders of tomorrow."